Juno Gemess photography chronicles the changes in the relationship between white and black Australia, capturing moments of high tension in the political life of the nation, says Zoja Bojic. Photographer Juno Gemes has spent the past 30 years documenting the political aspct of life of Aboriginal people in Australia. During these three decades there could hardly have been a moment that was not political. Armed with the photographic skills acquired during her sojourn in England in the 1970s, Gemes returned to Australia, where she had spent her childhood and youth, and was confronted with the new era in the relationship between white and black Australians. Her photography chronicles the changes in this relationship, capturing the moments of high tension and drama in the political life of the nation, although her works seem to be, and were intended to be, documentary. This retrospective emphasises her black and white work, which in turn benefits her approach. Yet the result of her approach is not mere reportage, but a series of independent works which together convey Gemess awareness of the historic importance of the moments they represent. It is these all-important morsels of history that tell the tale not only of the actual events and their significance but also of the atmosphere that surrounds them, although Gemess images cannot be labelled narrative. One does not have to be initiated in every aspect and every tale of the Movement to be able to fully grasp the two streams that run intertwined through the history of it: the tension and the drama on one hand, and the genuine will for reconciliation on the other. In the selection of both her topics and the works exhibited at this retrospective, Gemes provides her audience with her personal view and her personal stand on the issue of reconciliation. Perhaps the most obviously telling image of all is Essie Coffey (Bush Queen) and my Son Orlando Gemes, taken in Bundeena in 1978, where the wisdom and love are so clearly exchanged between her two subjects. Among her portraits are diverse subjects. The Women from The Stolen Generation, a photo of unnamed people huddled together at the very moment of speaking out, taken in Alice Springs in 2000, is an image that is equally historic, and perhaps even as heroic as the Jimmy Little  Musician, taken in Sydney in 2003. Recognising the achievements of Aboriginal people in various fields of life  from social and political involvement to arts  Gemes discovers and emphasises the strength, tenacity and will of many different individuals who are members of the Aboriginal community living in Australia in the last quarter of the 20th century. It is not by chance that this retrospective  and it is a retrospective not only of the artists work, but also of Australian history  is being held at the National Portrait Gallery. National  as this indeed is the history of the Australian nation. And the Portrait Gallery  because it is through her portraiture that Juno Gemes conveys more than her subjects characters, allowing them to acquire the role of a symbol of that moment in history in which they are placed. Within the Movement itself there is a great optimism and a belief that the spiritual life as well as the general contribution of Aboriginal people will be more broadly understood, recognised and respected. Gemess imagery conveys not only her own involement but also her personal beliefs in harmony with such ideals. 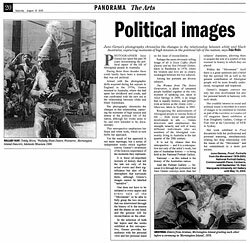 Her youthful interest in social and political issues is recorded in a series of images to be exhibited as part of the Larrikins in London (of OZ magazine fame) exhibition at Ivan Dougherty Gallery, College of Fine Arts at the University of NSW in Sydney. Her work exhibited in Proof documents both her professional and personal maturing, simultaneously relating her deep relationship with the issues of the Movement and her commitment to a more just society. © Zoja Bojic. Reprinted with kind permission of The Canberra Times.